There’s a lot to love about Thursdays (it’s always been my absolute fave day of the week, even though it’s obviously still a work day), including Grey’s, A Million Little Things, Top Chef, the very-real need to drink at least one glass of wine… at least… and the fact that every Thursday is Friday’s Eve. 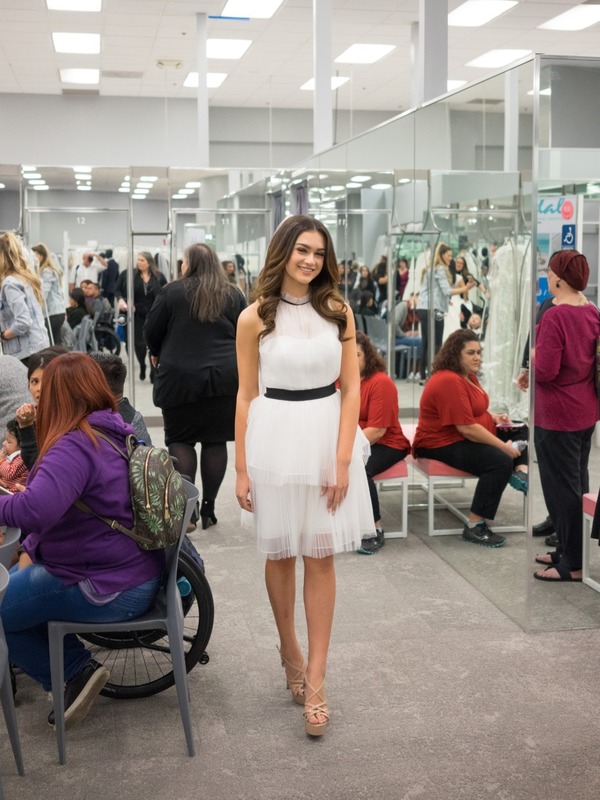 But last week we got to spend Thursday evening with David’s Bridal at the retailer’s Grand Reopening of the Costa Mesa locale. We had the best time ever, and didn’t even think twice about our Thursday night lineup burning holes in our DVRs 😉. From the minute we walked in the doors, we were hit with tons of pretty and a lot of refreshing in-store changes that got us so excited. If you were there with us, you certainly got to take it all in, too! But ICYMI, or you live somewhere other than the sun-drenched OC, we did our best to make sure you could come along for the ride. Insta stories, letttt’s gooooo. 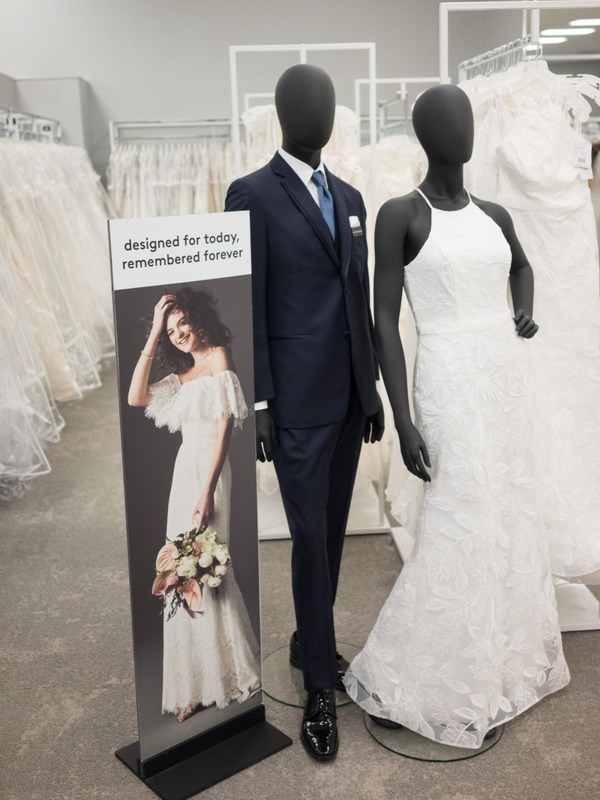 David’s Bridal’s NEW Spring 2019 collections have all arrived, so their exclusive assortment of wedding dresses, featuring a broad spectrum of silhouettes, lengths and styles, is yours for the taking. 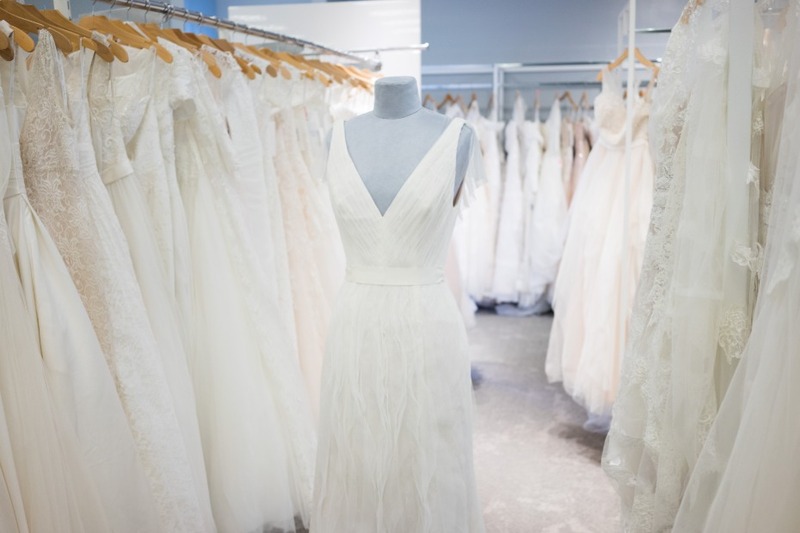 Their sizes span from 0-30, with petite and extra length iterations, so every woman can find the dress of her dreams. 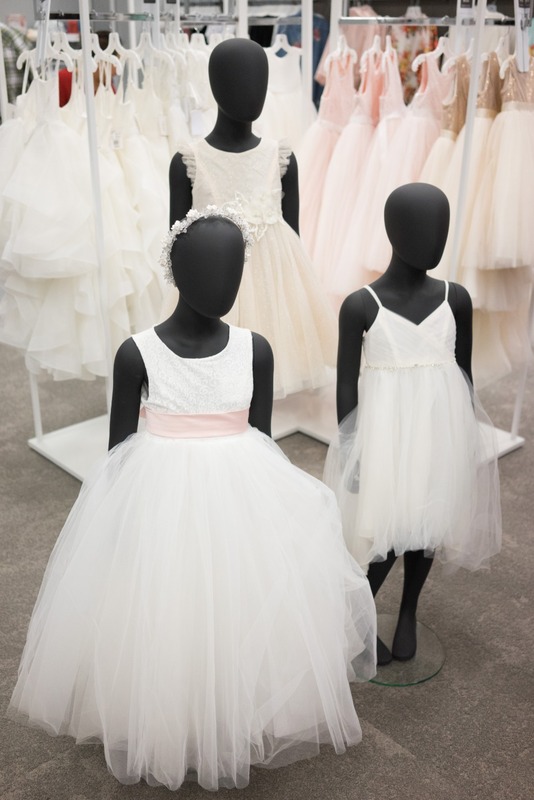 Even if you’re not a bride or a bridesmaid, the store boasts a full selection of social occasion dresses, prom and homecoming dresses, flower girl attire (literally the cutest dresses we might have ever seen), communion dresses, and outfits for mothers of the bride and groom. 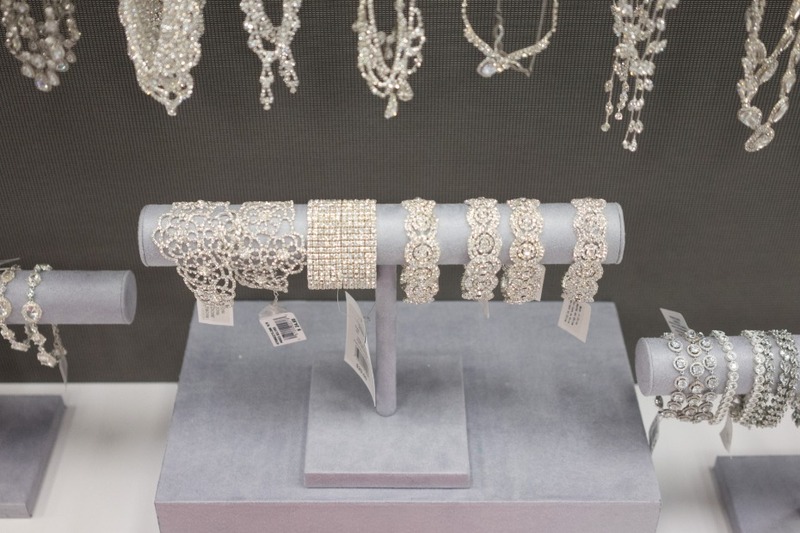 Once you’ve tried some dresses on and streamlined your aisle-style vision a bit more, you can tackle the rest of your head-to-toe look, from shoes and handbags, to jewelry and headpieces. They’re styled throughout the fitting rooms to make it easier to accessorize. 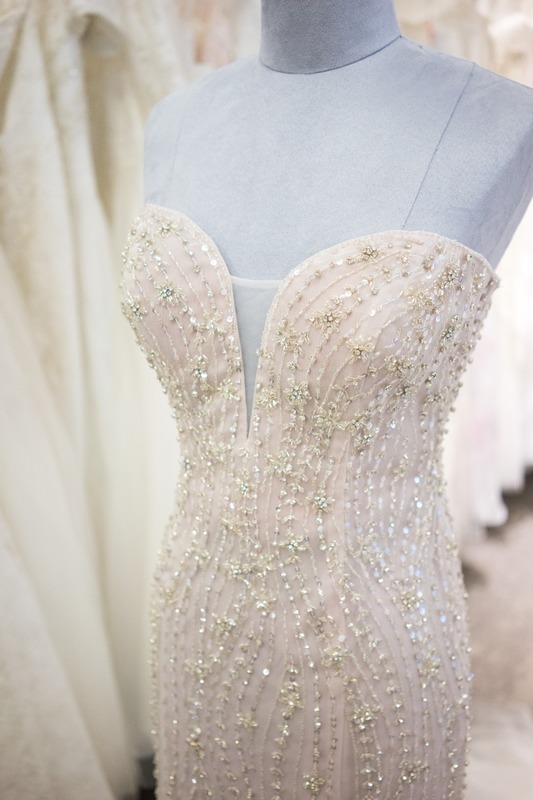 And you can’t forget about the foundation for every bride’s flawlessness, her undergarments! The store is stacked with bras, slips, and shapewear, and expert in-house alterations are available to make sure your dress is a perfect fit. Starting to think about popping the question to your squad - maybe even for a special Galentine’s Day surprise? DB offers an assortment of gifts for you AND your bridal party, such as robes, totes, tanks, tees and loungewear, mugs, and more! If something by Vera didn’t crush, we’d have to rethink everything in our lives. But her new Spring 2019 collection for DB definitely did, so we can all go on living our best lives. Really, the new arrivals for WVW were/are absolutely stunning, so incredibly sharp and crisp, and fiercely feminine. Not only are there some fun short (minidress) options☝️for second looks or, even edgier, first and only looks, there are also some infinitely-modern, clean and bright silhouettes with just hints of sparkle (think Meghan Markle, wedding day kind of sparkle). And even something non-white, for any brides who live for Vera’s flip switch when it comes to traditional aisle-style palettes. Have you ever known us not to enjoy a denim jacket for the bride? We adore it, every time it’s been done, so it’s not surprising that we obsessed a ton over DB’s turn with the trend. Flip flops, shoes and garters, headpieces and hair accessories. This David’s Bridal and every other one across the country has the goods to put a bride’s entire top-to-bottom look together. We were loving on their full wall of flats and jeweled flip flops, and had to take a breath at their accessories vignette, because all the headbands, headpieces and nuanced tiaras (+ bangles on bangles on bangles) were just too fab. Plus… there are sooo many amazing options online. Every season, their online exclusives are better than the previous, and there are quite a few cool new hair combs and hair vines (yes, look it up, because you’ve probably never heard of them except when Twigs & Honey is making the reference - yep, DB has a few of their stunners to get your hands on! ), bangles and statement necklaces that would KILL. Even cute stuff for the four-legged friends at home. Even though Galina Signature’s sparkle is a little more obvious than Vera’s (it’s all-over embellishment, sequin tulle, metallic embroidery type of sparkle), it’s still super glam and arresting. If you caught a glimpse of our Insta story, we literally walked over to one of the racks and it was radiating sparkle, twinkle, unicorn dust magic. 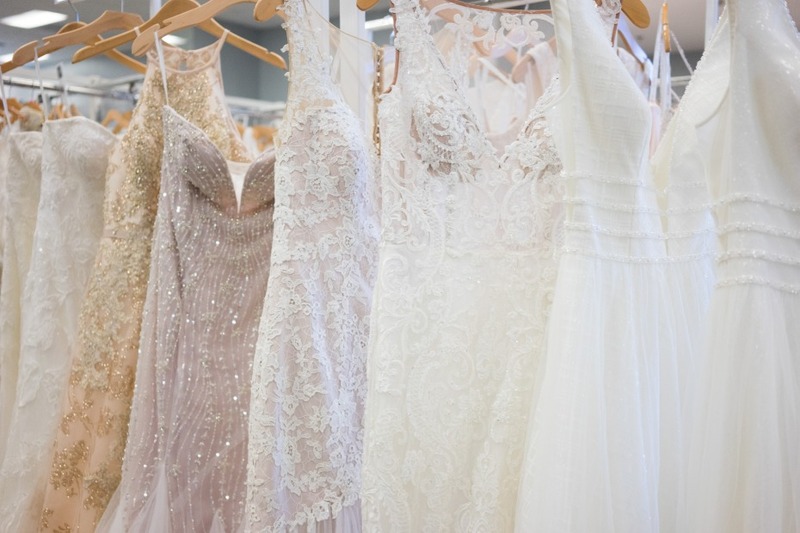 The dresses were beautiful and each one was better than the next. Thanks for having us, David's Bridal!! We're be back soon for those fancy [flip] flops!! !